The Swedish trio is more a pop / rock act like Matchbox 20, not a metal band. Only the ones who listen to M20 or The Pixies and other pop / rock bands should go on reading this, everybody else... Not your cup of tea! The Swedish entered the Swedish national radio charts with the first single of this album which is What Is The Influence and the video got aired on MTV Alternative Nation! 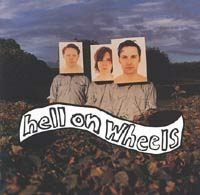 The song Power Bubbles shows a harder side of Hell On Wheels, but most tracks are smooth pop-rock songs.